The ERC II Driver has created a world wide stir with it's hot "ultra-thin" Forged Titanium face (which has been deemed illegal for tournament play by the USGA.. From Callaway Golf: "A revolutionary breakthrough in golf club technology," the ERCII features, "a large, ultra-thin forged titanium face with 'Variable Face Thickness' (VFT) Technology, and delivers greater ball speed, forgiveness." Scary long.... but hard to control. Longest recorded drive 369 yds with this... My Great Big Bertha is fully 40 yds back although I have a short shaft in that and it is my fairway finder. If you go after a drive and are 1% off the perfect shot.... prepare to be punished! I bought this club and others in a yard sale! I didn't know what I was about to encounter. I was playing with a titleist 910 d3 and when I tried the erc 2 I put my titleist away. The erc 2 was averaging about 30 to 40 yards longer off the tee ( 9* stiff fujikara 45 inch shaft) I couldn't believe it! I play in several home course matches and was easily using a wedge or 9 iron instead of a 6 or 7 iron on some par 4's This club worked fore so well that I bought another one as a back up and paid 4 times more than I had at the yard sale. It is true that you have to hit the sweet spot. but you should do that with all drivers and all irons. if you cant hit the sweet spot get some training. i am a ext. hcp 6.0 player and i have a lot of fun with this driver with an average drive of 382 Yards i am very satisfied. it brings you a longer drive. i also hit with long drive drivers of 4 degrees and with this ERCII i allmost hit the same lenght. just tee the ball a bit more up to the nose of your left foor (RH Players) and it will be easyer to hit. isnt this club illegal to use in comps?? p.s. If you swing from the inside there is no way you can find this club hard to hit. I found this club impossible to mis hit. I've been playing a Diamond Tour ERC II knockoff & liked the feel alot. Very low center of gravity, right size head. Somehow I got the real deal @ Edwin Watts used for $40 shipped. The REAL thing outdrives the knockoff (which I liked alot) by 20-30 yrds. I've tried LOT's of drivers. This is the longest/equel to my Cobra 310 which was longer than anything previously used. I hit it a few times in the back yard yesterday & played 18 today. Found it very forgiving, even my mis hits were slight slices or worm burners that carried 200. My long drives 240-260. These people who claim to hit 300+ yds are full of IT! If you like samller profile (330cc) this is your ticket to get a $600 club for 1/10th of original cost! BB titanium, Cobra SS 310, powerbilt, Titlest 975J, several others. I have to admit that I'm not that great in golf, but I got this driver for a long time already. Yes I have to say that it's the pain at first to drive the ball straight. The driver's sweet spot is so tiny and the face is so curvy! of course it's very hard to hit it straight. But then with some adjustment of my stance and the way my downswing is, the ball just explode!!! and the best feeling is the "sling shot" feeling on a driver's face and the sound. The ball just seem so unstoppable. I think this driver is the real challenge. The lower body gotta be REAL still and not much force on the right hand swing easy and then you'll be looking at 300+ yrd or so. I'm still trying to master this challenge even tho a mis-hit suffers! None cuz this is the worse and the best i've ever tried. While I generally hit this club well, I have snapped the shaft twice on clean hits. The first time, the shaft snapped between my hands. The second time, it snapped in the middle. 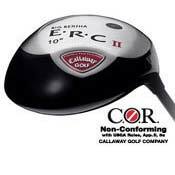 Callaway just re-shafted my club, even though I am way out of warranty. I got this driver used for about $200. What a waste of money. It's true the odd drive will go 300+ yards but slight mis hits suffer. For me a typical mis hit shot resembles a baseball curveball that rolls about 200yds. I can also buck slice it directly into the bush. My swing can produce better results with almost every other driver I've tried. If you don't find the sweetspot on every swin this is not the club for you.